The Ordinary High Water Mark (OHWM) defines the lateral extent of non-wetland waters and is regulated as “Waters of the United States” under Sec. 404 of the Clean Water Act. 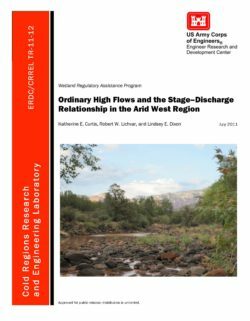 Previous research has developed a reliable and repeatable methodology for identifying the OHWM on ephemeral and intermittent streams in the Arid West using the physical features of the channel (Lichvar and McColley 2008, Curtis and Lichvar 2010). This study expands upon the previous reports by providing an analysis of how gage data may be utilized in OHW determinations. We clarify the methodology for using gage data, review the potential errors encountered in developing a stage–discharge relationship, compare the position of the gage-predicted OHWM to the field OHW signature, and determine the recurrence interval and flow duration of OHW events. The field OHW signature often is not associated with a 2-year flood event like many assume, but ranges from <1- to 15.5-year flood event. This large variation in recurrence intervals for the field OHWMs makes it impossible to define the frequency of the ordinary high flow from gage data because the OHW event is unique to each channel.